Its now time to kick off the CRM Watchlist 2015 reviews with the Lifetime Achievement Award, This is arguably my fav. Know why? If you watch the Oscars, you will notice that a lot of the time the person who gets lifetime achievement didn’t win the Oscar any particular time but at the same time has such an extraordinary body of work that the recognition is not just worthwhile, it is necessary. This is how I feel about the lifetime achievement award for the Watchlist. The past winners have won myriad other awards, but whether they did or not, they’ve accomplished so much and had such a strong impact that it makes far more sense to honor them with something that recognizes the many years they have impacted business and for the personal touch they brought an institution. An award for a single accomplishment, while great, seems inadequate in the face of all that. The CRM Watchlist Lifetime Achievement Award is that kind of bigger award, thanking the winner for the positive continued impact they’ve had on the CRM and associated industries. All of them have been incredibly important in the history of business or some aspect of business. But this year’s winner can stand proudly with all of them. 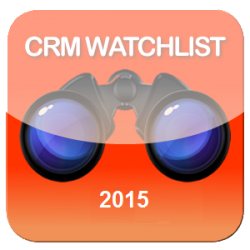 I’m proud to announce that the winner of the 2015 CRM Watchlist Lifetime Achievement Award is…CRM Magazine! This wonderful publication is actually a business anomaly to some extent. It is a magazine that is not only surviving in an era when print magazines are declining dramatically but it is increasing its influence year over year. Its awards such as the Market Leaders and Rising Stars are coveted by the industry and proudly trumpeted by the winners each year. It is the only institution in the industry to have a CRM Hall of Fame, and it is a serious honor to be part of it (in full egocentric disclosure, I am one of the few accorded that honor). But its influence goes beyond that. It is perhaps the single most influential entity (meaning institution or person) in the CRM industry. Ever since it was founded as Sales and Field Force Automation magazine in 1997, it has been shaping what the market is and who the influencers are. It plays a big part as “kingmaker” when it comes to naming influential people in the industry. For example, look at this list (which is very much a pioneers list) of influencers it identified as far as back December 1999. Their real power came after it went from a magazine that focused on sales and marketing automation, which were seen as two separate pillars of customer facing activity to a focus on an holistic CRM in April 2000 after renaming the publication CRM Magazine in March of that year, because “the New Economy is upon us” according to then Group Publisher, Spencer Ewald. From then on, the magazine became the central place that we got information about CRM strategies, trends, technology, vendors, and best practices. Nothing in 2015 makes that any different. Its model works so damned well too. It not only has had and has best-in-class editors over the years such as the incredible Ginger Conlon (now editor in chief at the Direct Marketing News) and now for the last several years, the extraordinary David Myron, but it had and continues to have some world class writing and writers. Over the years, these folks have been able to make sense of the market, parse the industry so that a regular Joe can understand it, and anticipate trends in the CRM industry that become quite meaningful to the participants in the industry, because it allows them as vendors or buyers, as analysts or other journalists to plan ahead and think through what they need to do. Another interesting thing about the magazine is the willingness of the industry to write for it. Over the years, not only have it had the inputs via columns, quotes in features and judging its awards from influencers but also from leading vendors and buyers. It takes the perspectives from multiple domains and presents them to its readers. But it doesn’t stop with the print publication. CRM Magazine’s digital property DestinationCRM, is one of the most visited and perhaps the most real time digital property serving the customer-facing community.Not only is the magazine online, but the coverage of the vendor conferences there by the intrepid staff appears digitally and is consistently excellent, complete and current. So if you want to know what is happening at Dreamforce in near real time and don’t want to track tweets, read DestinationCRM during the conference, you’ll know. The parent group, Infotoday, is also the owner of the most diverse CRM conference in the industry, CRM Evolution. This is the one conference which brings together the largest community of influencers, analysts, other journalists, vendors and buyers each year. It’s an opportunity to discuss the trends, figure out how to do stuff better and just par-tay! It is a great networking opportunity. The influencer attendance each year is mind-boggling, which just shows you the respect that CRM Magazine is accorded. The number of submissions on the call for speakers is several hundred to show you the level of interest. If you’re intrigued, this year, the conference is August 17-19 in New York at the Marriott Marquis Hotel. CRM Magazine has been a seminal influence and a continual presence in the CRM industry since 1997. A good deal of this has to be put on the doorstep of its current editorial and conference program director David Myron who has been a calm visible presence in the industry for a decade now. Since he came on board at CRM Magazine in 2005, he has been not only a steady hand guiding the magazine to its current influence and quality, but has been an influencer in the industry himself. He has made sure that the writing reflects the market and at times has made sure the magazines content helps guide the market. Because of its guidance to the industry for over 15 years; because of its consistent editorial quality and its influence on the work of influencers, analysts, vendors, buyers and other journalists and because it has continually been populated by talented, skilled and just plain good people, let’s raise a glass, or give a hand if you don’t drink, to CRM Magazine as the 2015 CRM Watchlist Lifetime Achievement Award Winner. Take a bow, CRM Magazine.